DAY 280: The Rubik in Narrow. From our top-shelf line. Get one here! 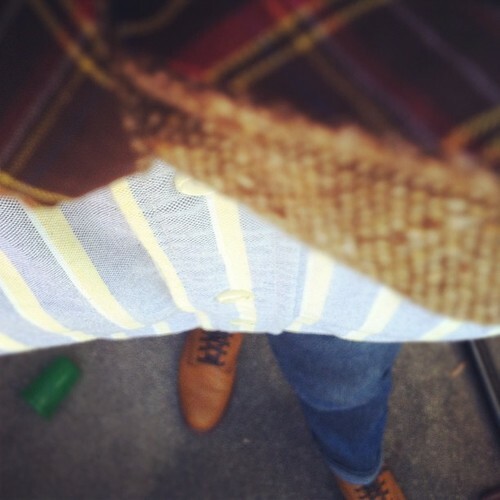 DAY 281: Navy Linen. Diamond Point. Very nice. Yours is here. 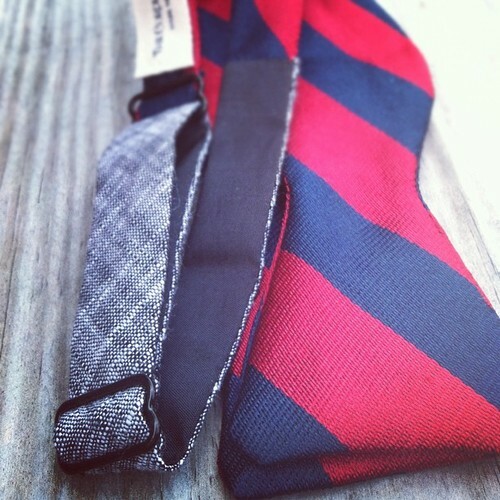 DAY 282: Our archived Morrison Classic: houndstooth and solid khacki reversible. Get it here. DAY 283: Another archive, the Malcolm Classic. Get yours here. 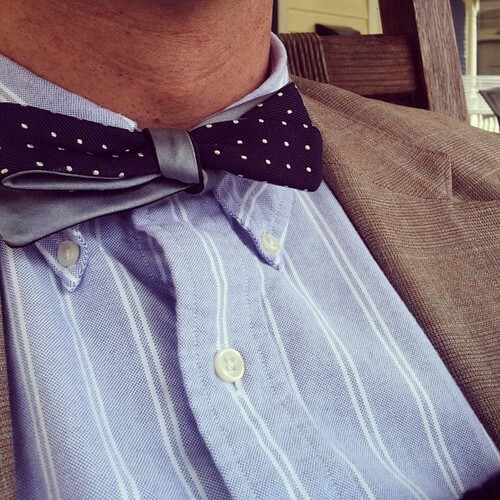 DAY 284: Sharp & snazzy. 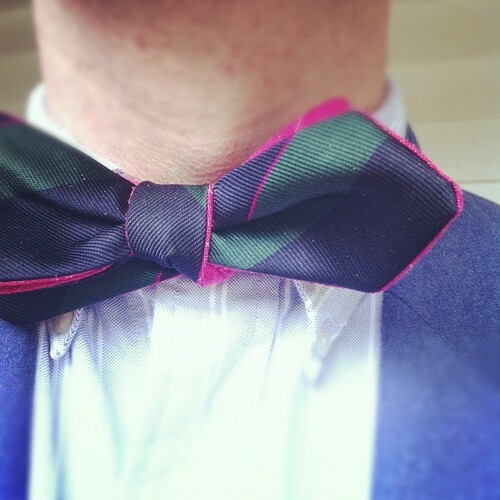 Pink linen with pinstripe / green and navy striped silk reversible. Club Diamond. Here it is. 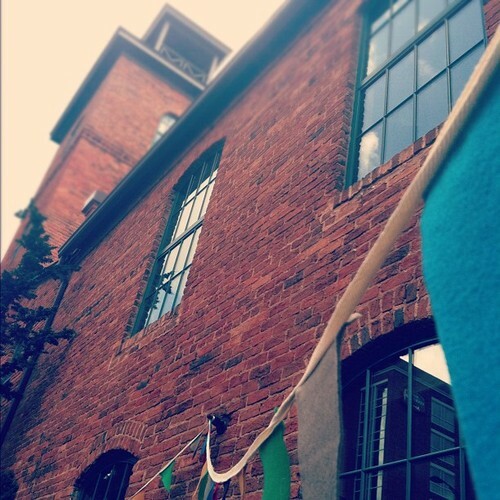 DAY 285: Brown wool with almost microscopic dots. Classic cut. Get it here. 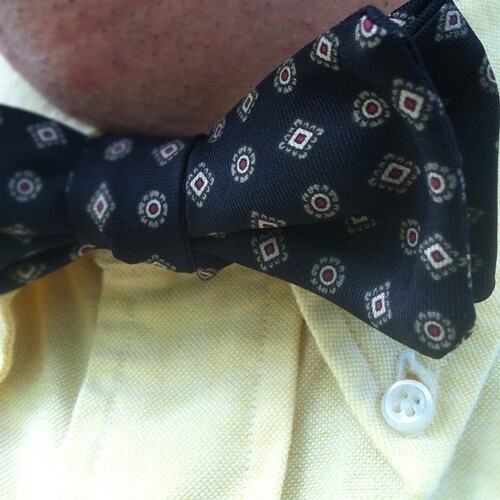 DAY 286: Another special from our top-shelf line: The Orville. Club Diamond. Grab it here. 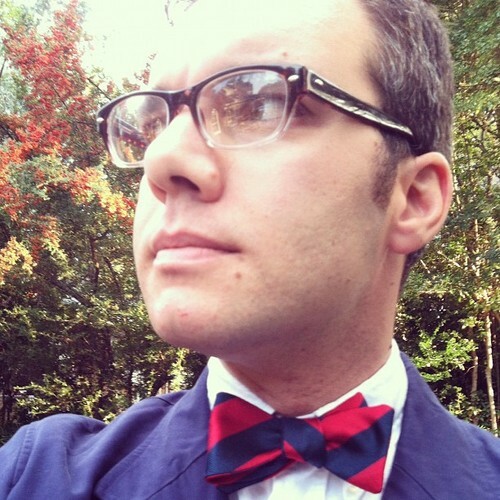 DAY 287: The sold-out Bates makes another appearance with a navy silk striped red and green in a straight batwing reversible. Here it is. 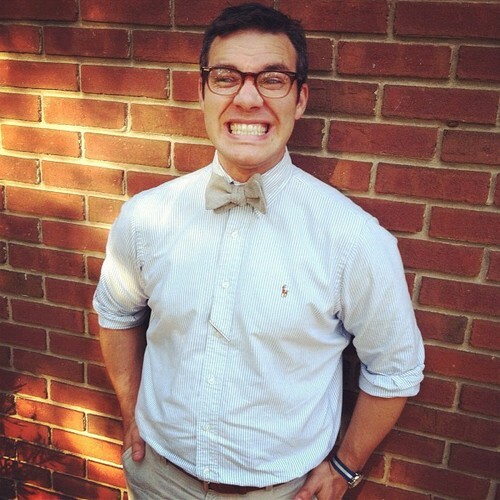 DAY 289: A trusty Diamond Point Neal. Get yours here. Every last cent goes to support children in Haiti! 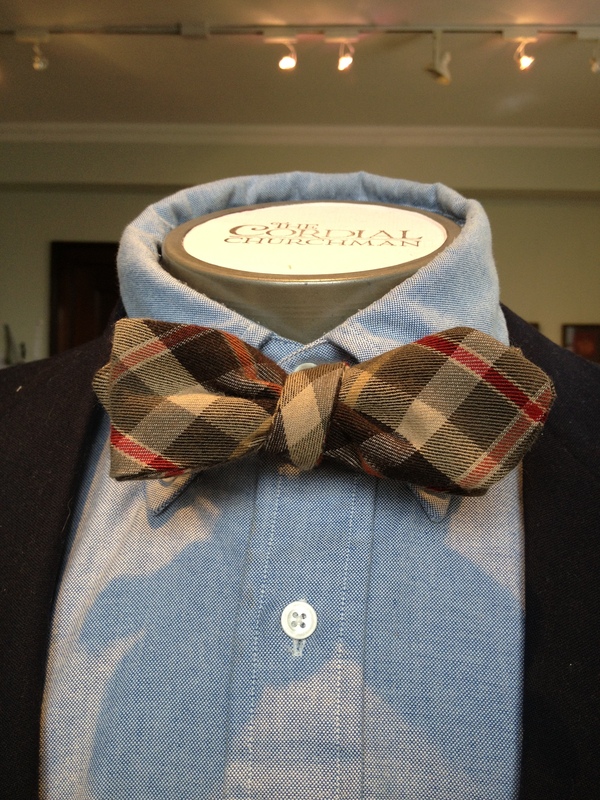 Day 277: A lovely thick navy and beige wool plaid sent to us by a customer. 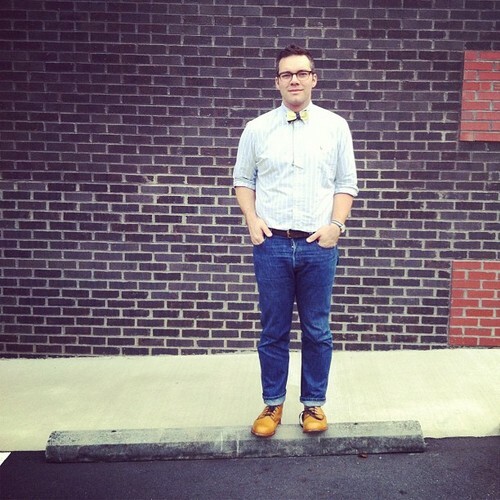 We made a bow tie for him and - per his request - one for Andy to wear for the 366 Haiti Project. Perfect for your winter wardrobe. Get yours here. 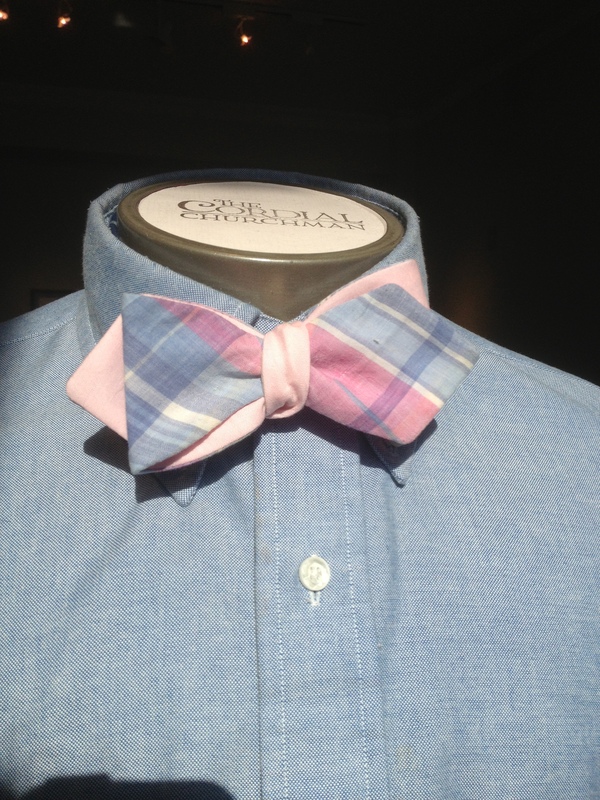 Day 279: Made from an old shirt, this beautiful pastel madras/pink chambray reversible diamond point is quite dashing. Yours is here. Day 213: Raspberry red silk with x-patterned emblems. Classic Butterfly. Get it here. 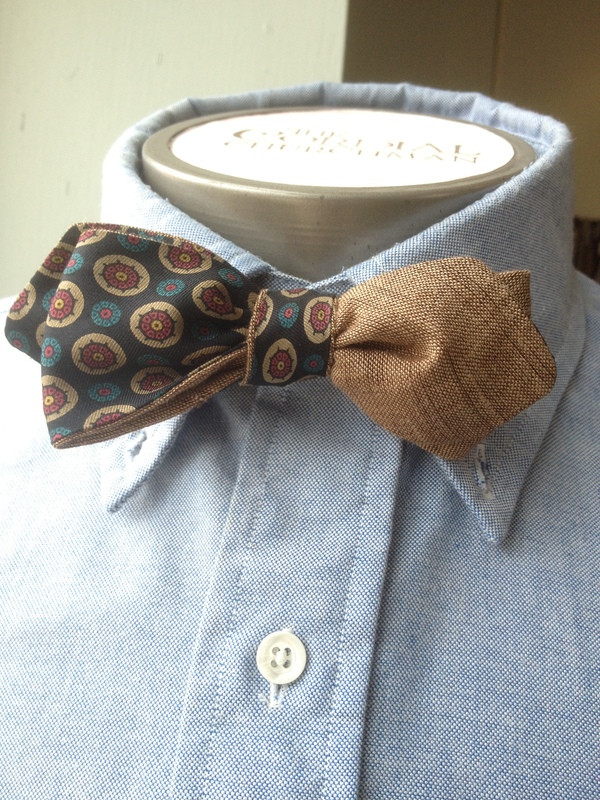 Day 214: Navy silk with foulard/Brown linen reversible. Club Diamond. Find it here. 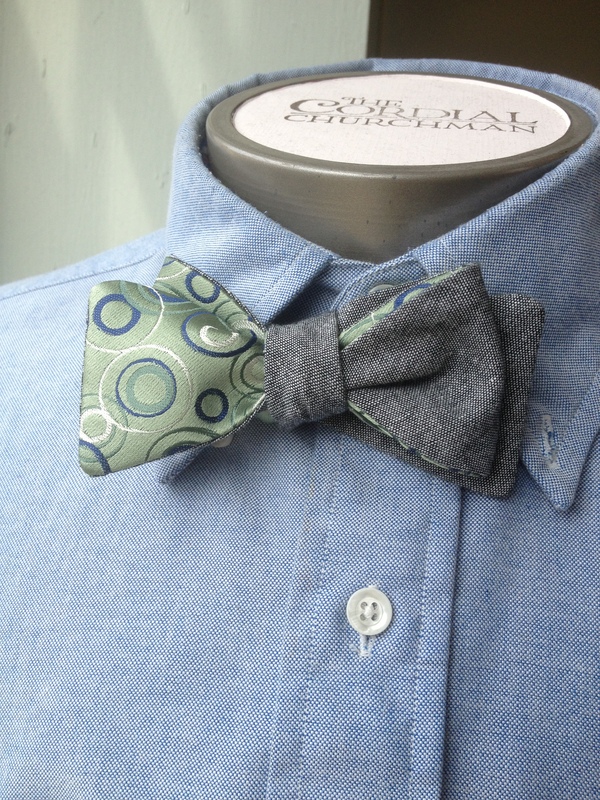 Day 215: Mint green silk with blue, white and green circles/Damien grey chambray reversible. Narrow cut. Get yours here. 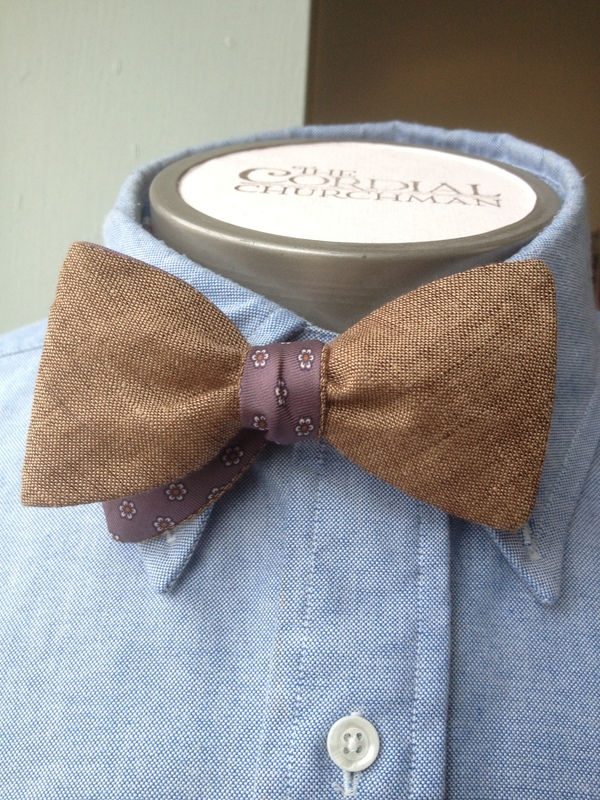 Day 216: Purple silk with flower foulard/Brown linen reversible. Classic butterfly. Get it here. Day 217: Our fabulous McAllister in a narrow butterfly. Yours is here. 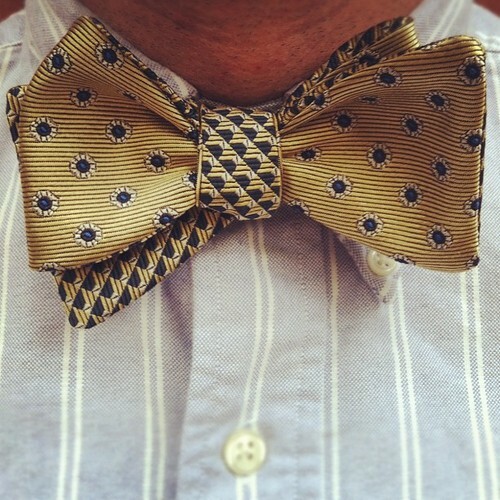 Day 218: Striking gold silk with complex striped pattern. Diamond point. Get yours here. 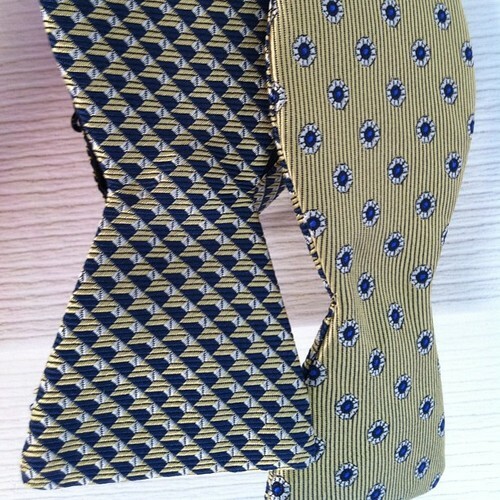 Day 219: Yellow silk with foulard/Navy chambray reversible. Narrow butterfly. Get it here. We've got a mess of reversibles for you, everything from wool to silk to double chambrays! 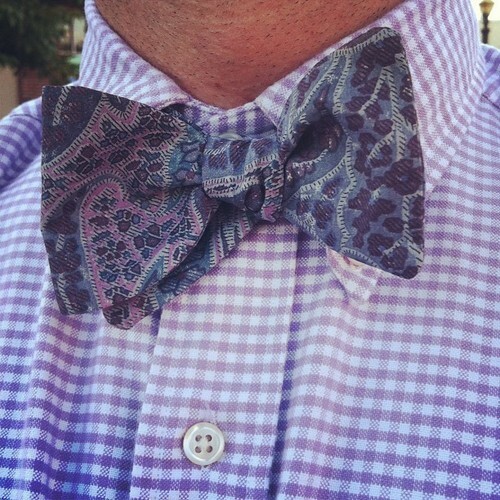 There are also a few special silks, madras and ginghams in the mix. Happy shopping! 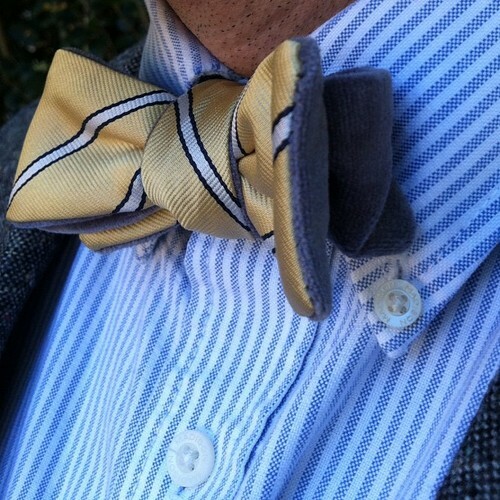 Day 276: Our handsome, archived James paired with an equally handsome beige wool with stripes. Get it here. 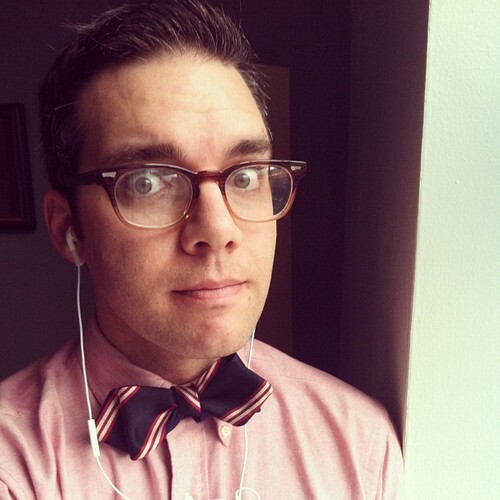 Day 275: Actually a maroon-burgundy silk Classic with purple foulard. Yours is here. 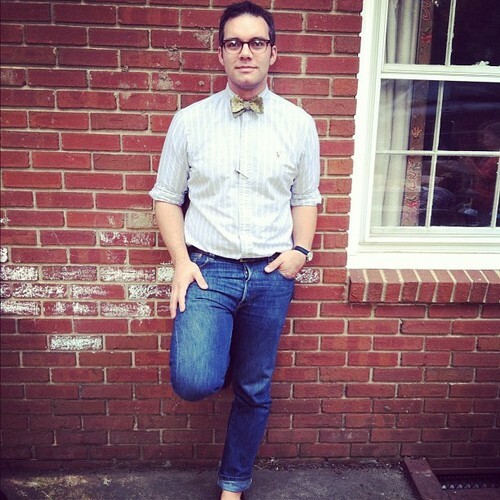 Day 274: Blue & Green Chambray Reversible Classic Butterfly. Get yours here. 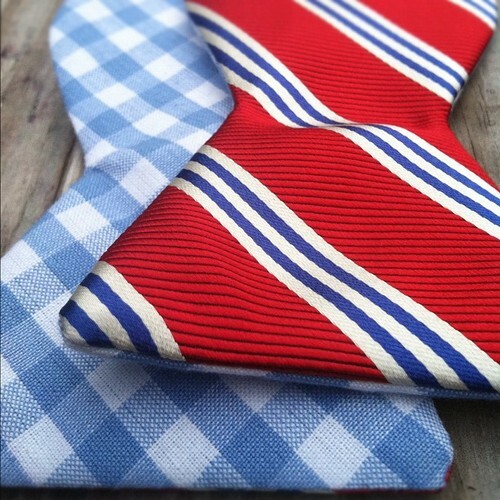 Day 273: Snazzy red silk with blue and white stripes, light blue gingham on the reverse side. Yours for $29. Every penny goes to Haiti. 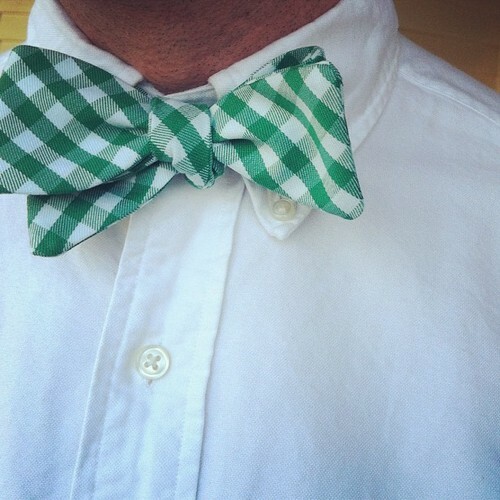 Day 272: A fun Kelly Green gingham in the Narrow Butterfly. Grab it here. 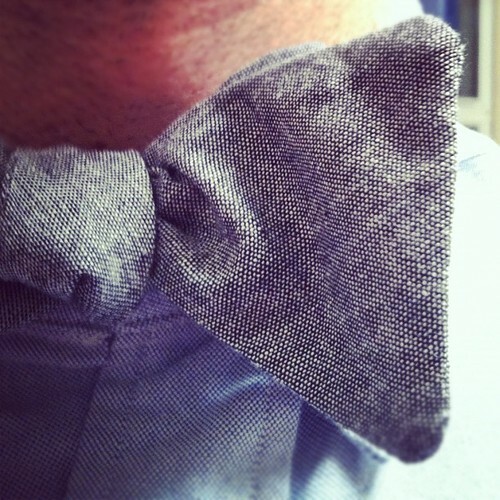 Day 258: Our Damien Grey Chambray Classic. Get it here. 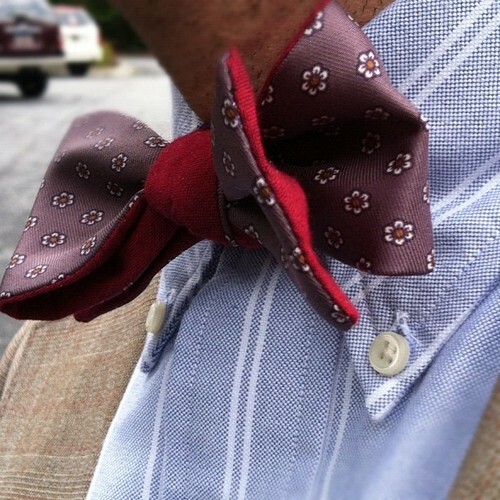 Day 221: Dark lavender silk with flower foulard/Cranberry Chambray Reversible. Should be highly envied. Get yours here. 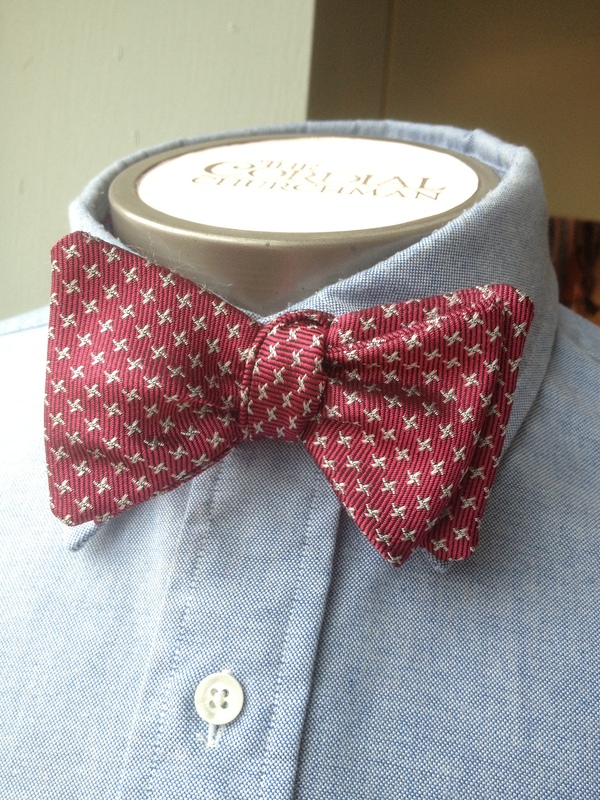 Day 203: Possibly one of the best TCC two-toned combinations: Sold-out Chadrick & Cranberry Chambray in Club Diamond Style. Yours is here. 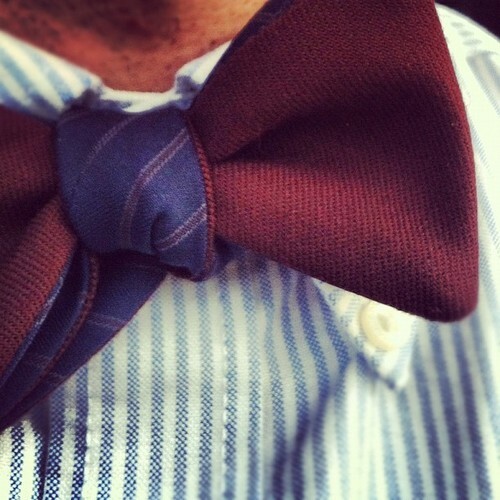 Day 198: Striped navy with brown wool reversible. Classic cut. Get it here. Day 153: Red silk with seahorses! Yours is here. 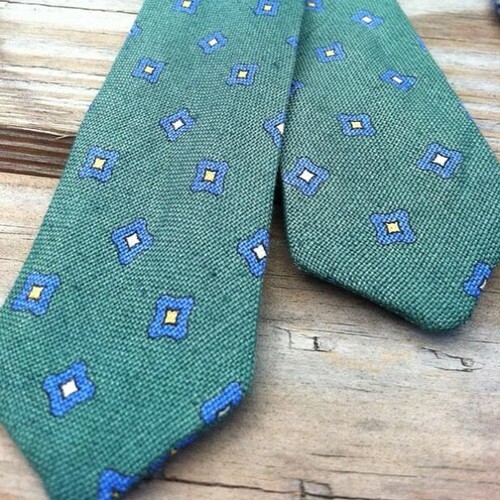 Day 264 is a handsome silk reversible. My high school colors, in fact---blue and gold. Classic cut. Grab it here before it's gone. Day 263 is about as classic as it gets. 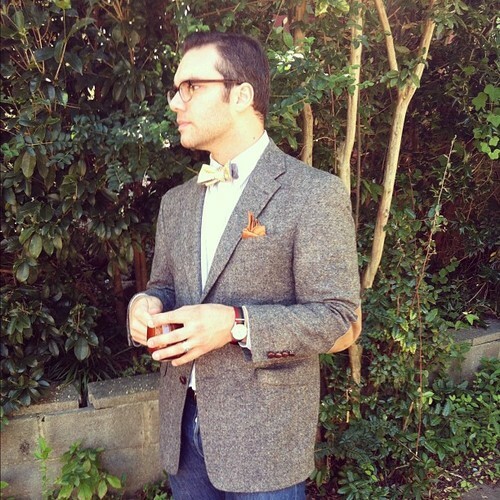 I was offered an honorary doctorate at an Ivy League school just for wearing it. Silk, of course. 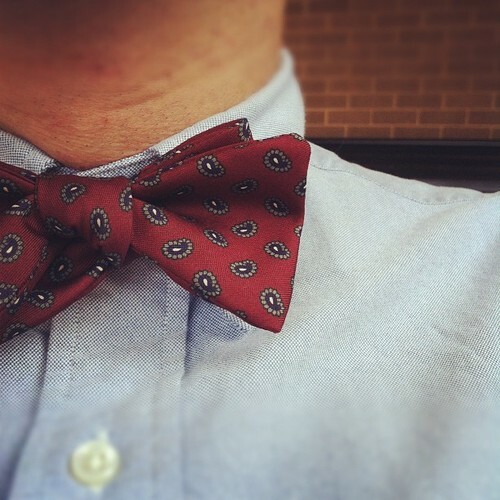 Navy and red. Day 265 would represent only 100 days left of this project ... if it weren't a leap year. Actually, it still might. I always get confused with these calculations. Do you count inclusively? Exclusively? I dunno. 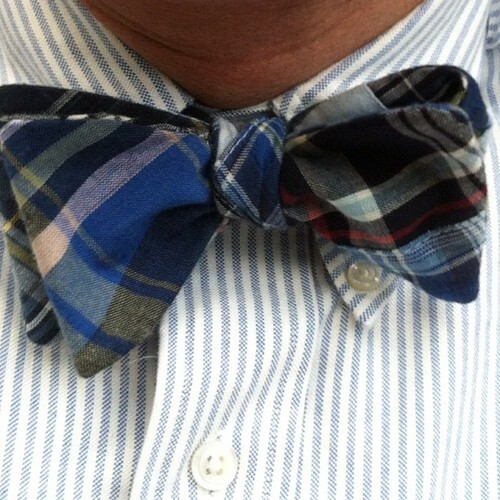 Day 262 is a sharp, classic batwing navy foulard of vintage necktie silk. Get it here. 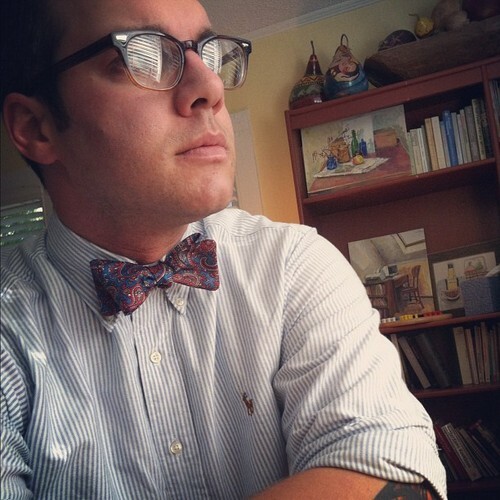 Day 261: more classic repp stripe-age. Diamond point cut this time around. Please don't buy this. I want it for myself. No. I'm being selfish. You can buy it. Besides, all the cash goes to Haiti. Yes, do buy it. (But then give it as a gift to me!) Here it is: go get it. 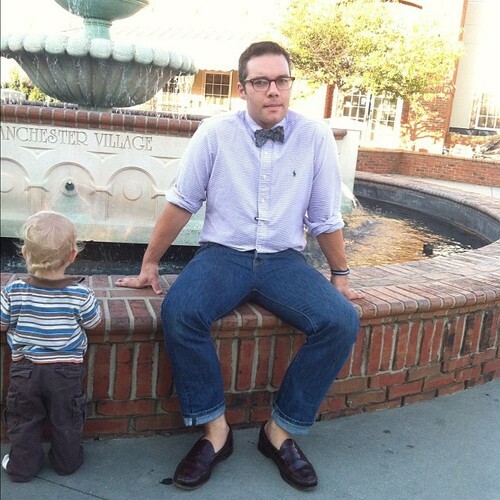 Usually we can't get them to be happy and be in bow ties. Owen's favorite line is "Lame. 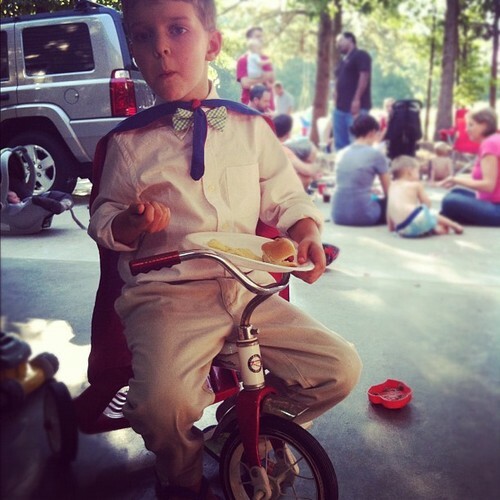 I don't want to dress like Papa." He's a pre-teen at age 4. But this time around, they both decided they wanted to be magicians, so they needed a bow tie and a cape to go with their wands. Okey Dokey. 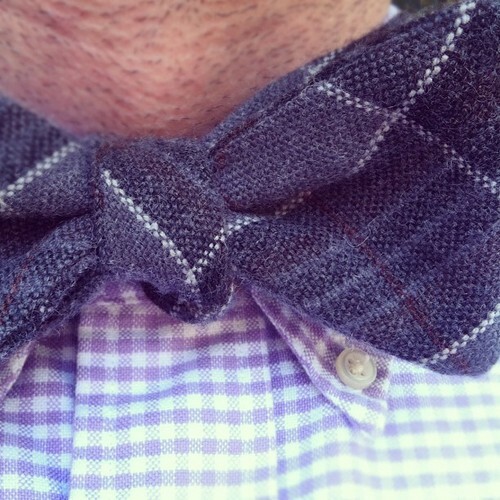 Today was the first day for tweed. 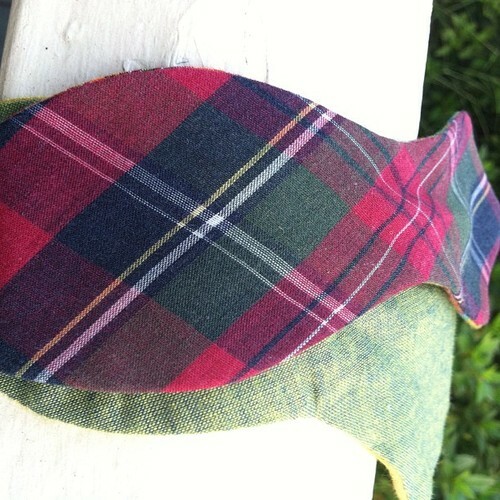 Great to get my favorite Donegal out, with the elbow patches and all. And Day 270 called for a straight batwing silk repp stripe X gray velvet reversible. It's really one of my favorites of the year. Yours for $29, all of which goes to Haiti. Grab here. The other great thing about Autumn is that it's now sock season. 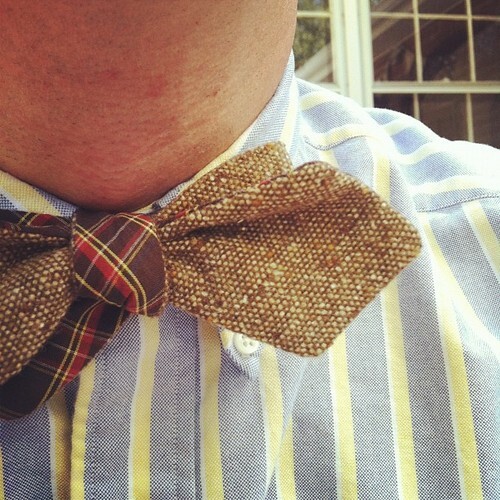 Yesterday's bow was actually also one of autumnal Donegal, but this time in the bow tie. Half of it, anyway. 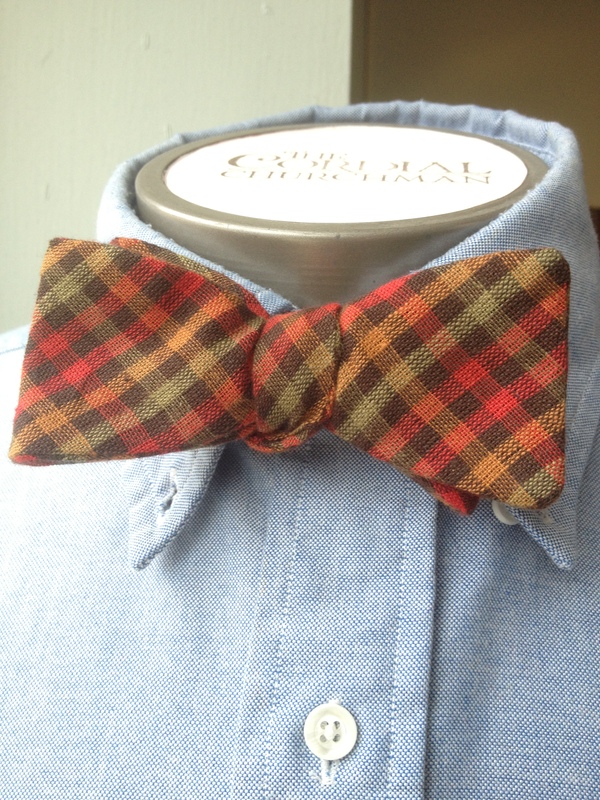 Check out this gorgeous tweed with a reversible cotton plaid in diamond point. Grab it here. 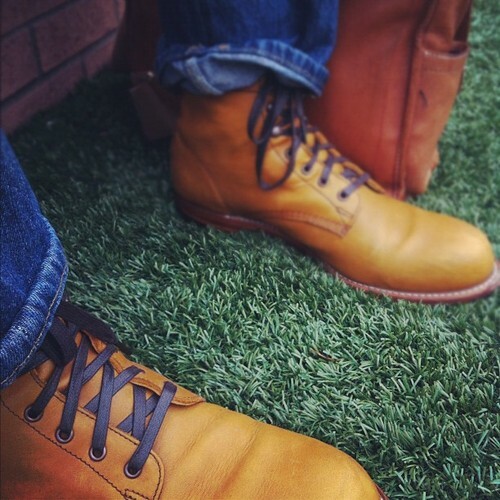 More autumnal awesomeness: boots. Wolverine 1000 Mile boots, to be more precise. Saturday night I got to see and hear The Secret Sisters from Muscle Shoals, AL. 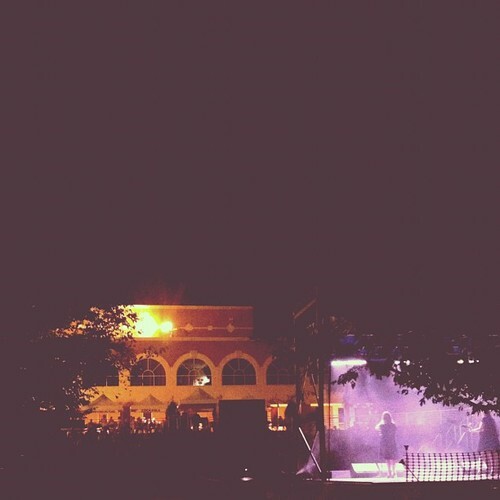 Good tunes in the Old Town Amphitheater. 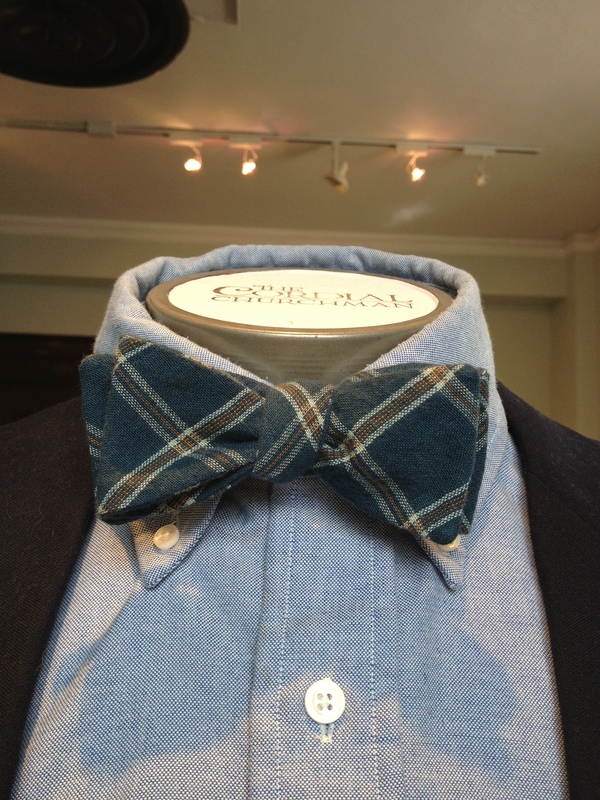 And a good occasion to wear --- you guessed it!--- a bow tie. 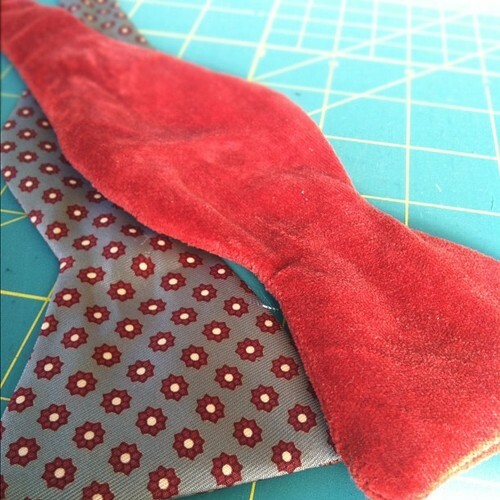 This vintage necktie silk crossed with rust velvet in butterfly shape -- Day 267. Can't ever get this one again after this one's gone. Grab it here. Was pretty wiped after the show, I guess. 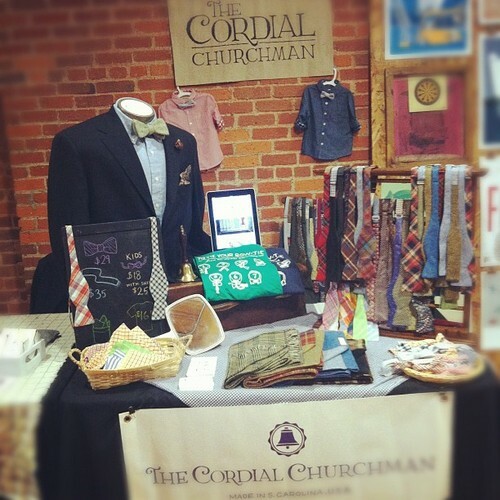 A weekend ago we at The Cordial Churchman enjoyed our second appearance at the esteemed Indie Craft Parade in Greenville, South Carolina. 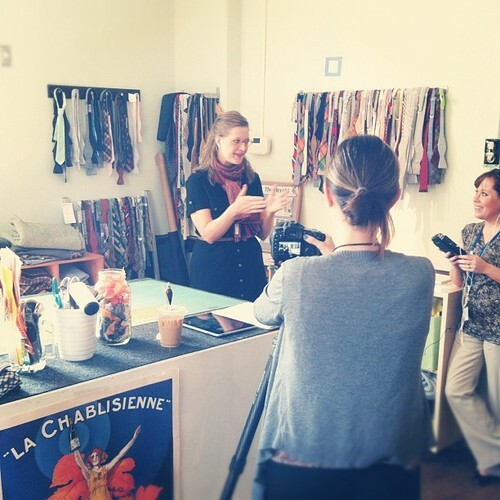 This was a delightful experience, as it was two years ago, and one that we look forward to sharing with artisans and crafters in the coming years. 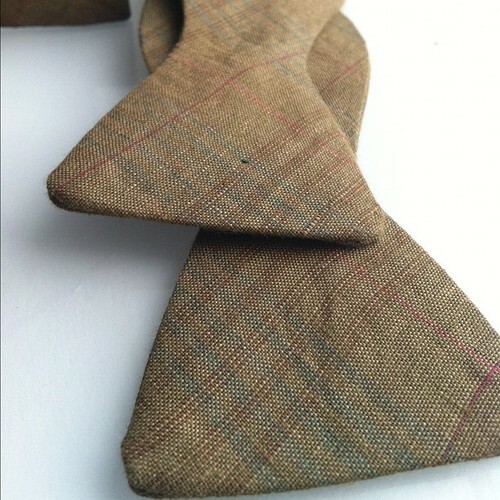 Somehow in all the hustle and bustle of selling bow ties, showing guys and gents how to tie one of these suckers, and making very, very strategic trades with Sweeteeth Chocolate (! 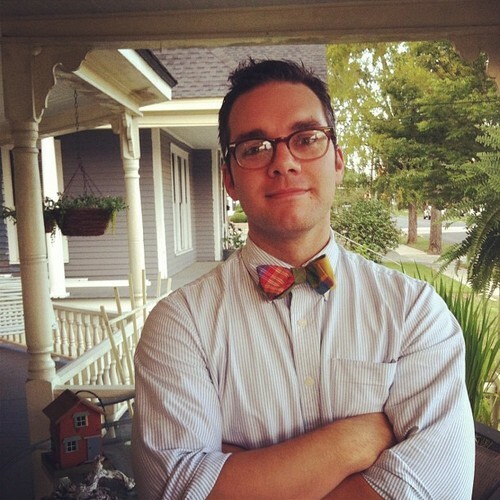 ), I forgot to snap a photo of my bow tie of the day in action. But here it is in its boring, static form. Sheesh, you can't even quite tell that this is dark navy blue. Ah well, you'll have to take my word for it. 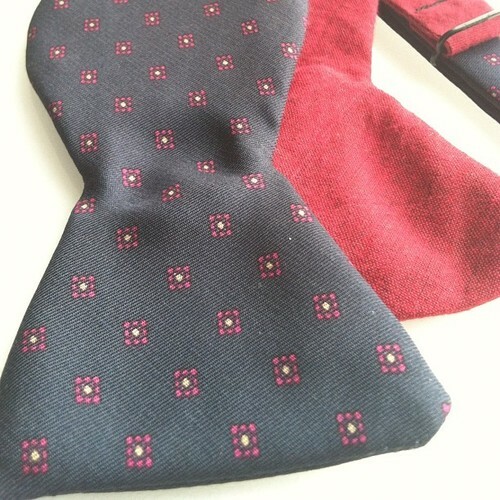 Half vintage necktie silk; half red linen. Sharp as nails. Get it here. We also had the pleasure of meeting a couple fine young television journalists with SCETV at The Cordial Churchman studios this past week. 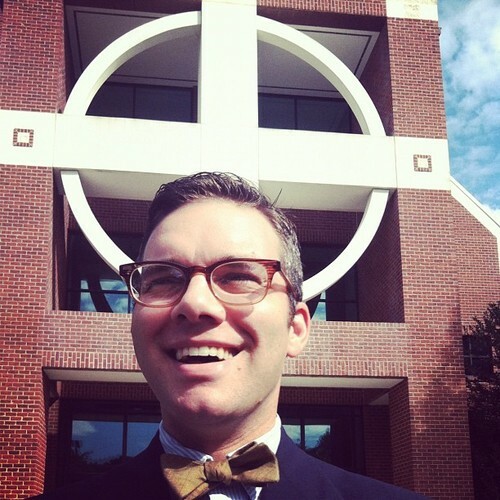 Ellie and I clumsily told the story of TCC's origins and prognosticated about its future. Let's hope these journalists are also stellar editors so that they can come up with something coherent that doesn't make us look like the goobers that we kind of are! Ultimately, it will be available for us to see here. 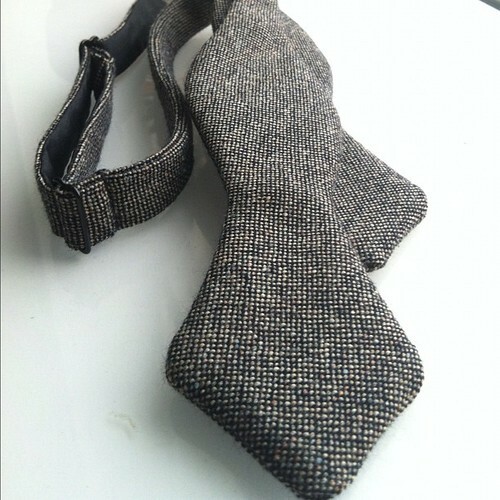 I chose a distinctly fall and winter bow tie: a gray tweed wool diamond point. Simple, but smart, you'll agree. Ahhh, Sundays. Love them Sundays. 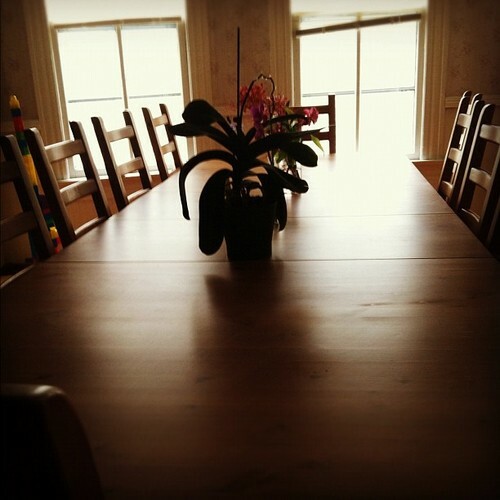 That's a pretty table there, but pretty quickly after the photo was taken, it was covered with hot dogs, pickles and chips and crowded with kiddos and grown ups for a delightful Sunday supper. 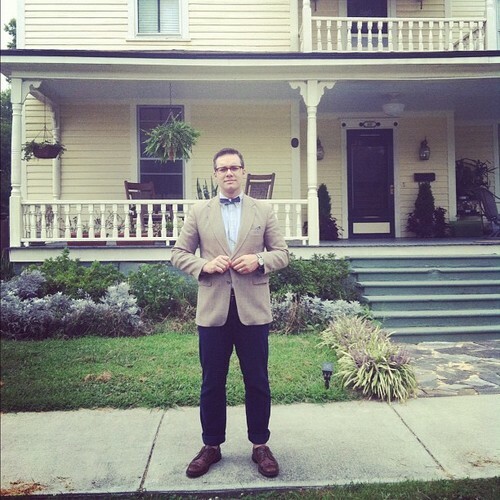 And here was the setting for said meal: a beautiful home in Historic East Town Rock Hill, SC. Our friends recently moved here partly in order to be really close to where our church meets and ministers. I'm glad they did, because that means frequent hot dog suppers! 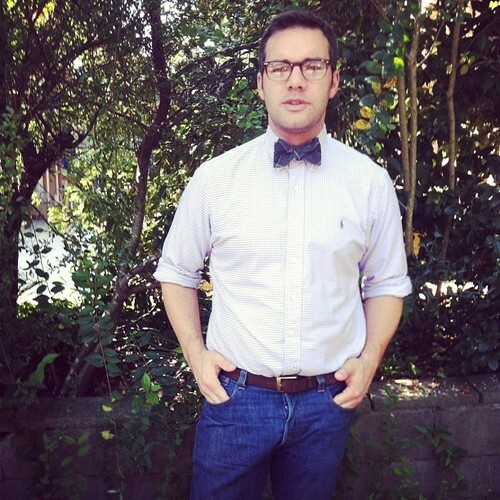 Picked a super duper skinny reversible silk bow tie---navy with polka dots and gray, made, I'm assuming, by Dominique, our most abstract visual artist and haberdasher---for my Sunday swag. 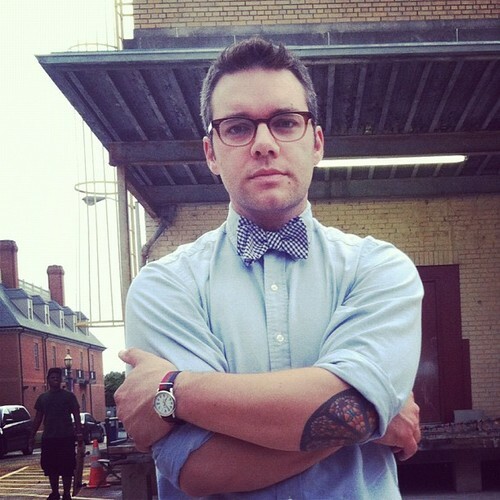 Snappy smart, I think. 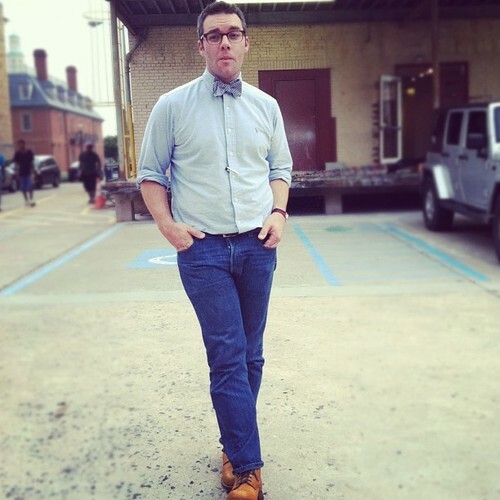 Kind of hipster, too, whatever that means. 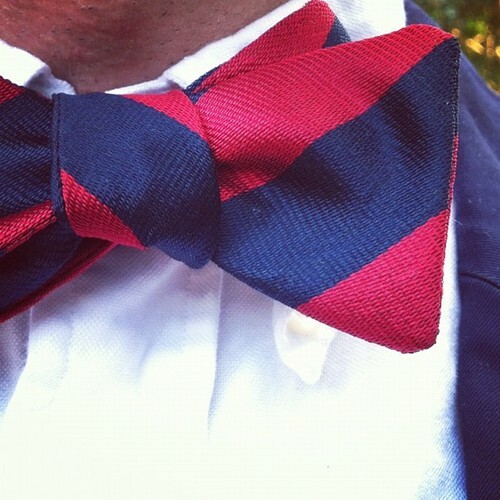 There may be more super duper narrow bow ties coming your way, but this is one of a kind. Grab it here. 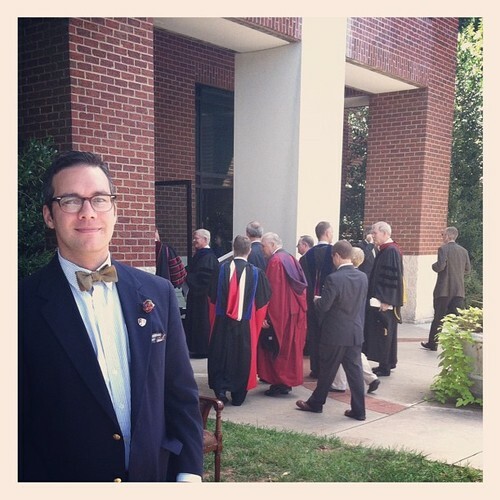 Friday I found myself attending the inauguration of Reformed Theological Seminary's new Chancellor, Mike Milton. I enjoy all the pomp and circumstance of these occasions. It's also stimulating to hear from and interact with folks who have been working in my field for longer than I've been in existence. 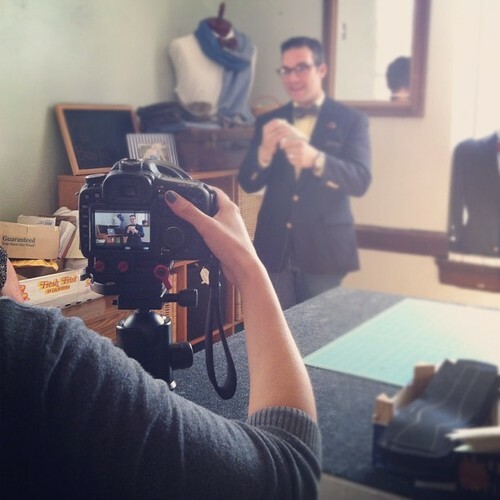 It helped remind me that, D.V., I'll have another of my own lifetimes to do some neat, meaningful things. 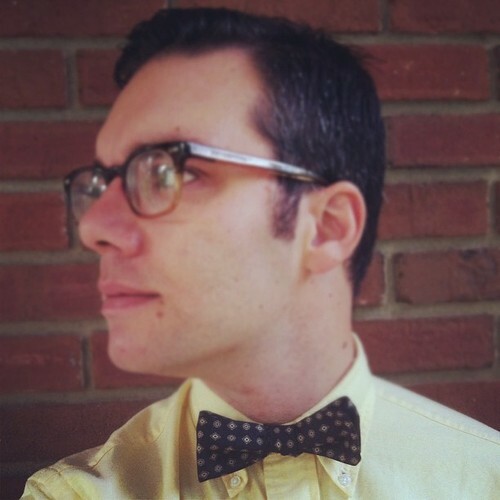 I chose a great, subtle, versatile, classic shaped, season-stratling bow tie for the not-exactly-summer/not-exactly-fall occasion. See these subtle hints of blue and red in with the neutral foundation? See the fantastic texture? Go and get it. And don't forget that all these proceeds go to Haiti, to help children get a good education in a stimulating, life-changing environment. 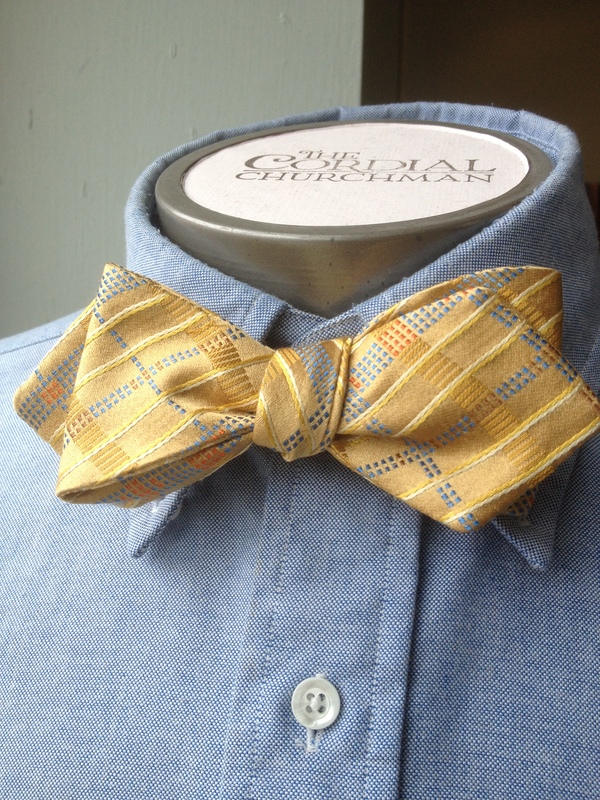 At first it appears to be your average colorful diamond-point plaid bow tie from The Cordial Churchman. But don't be fooled. 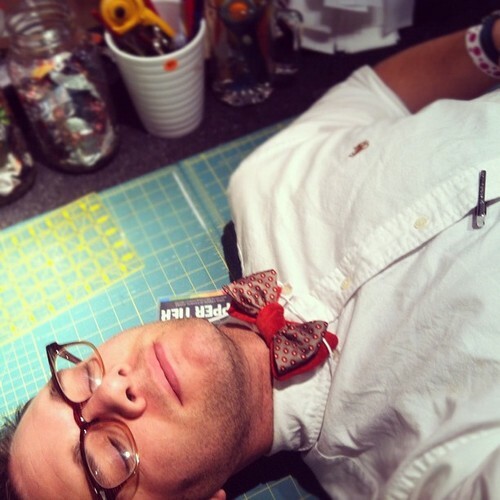 The thing about having a couple seamstresses who are art school graduates is that, when faced with the need to come up with 366 unique bow ties over the course of AD 2012, they don't fret. 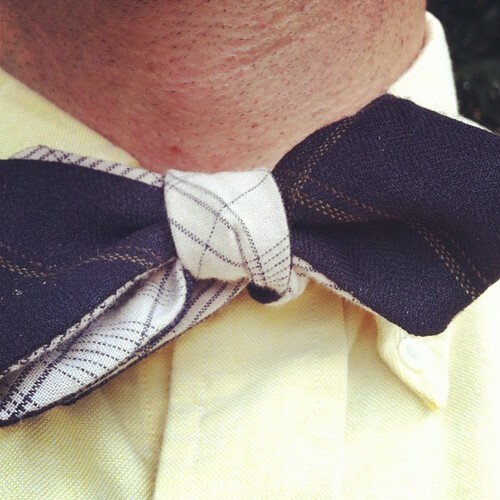 On side one, you can display the punchy, bold primaries of the plaid and the quirky yellow linen. 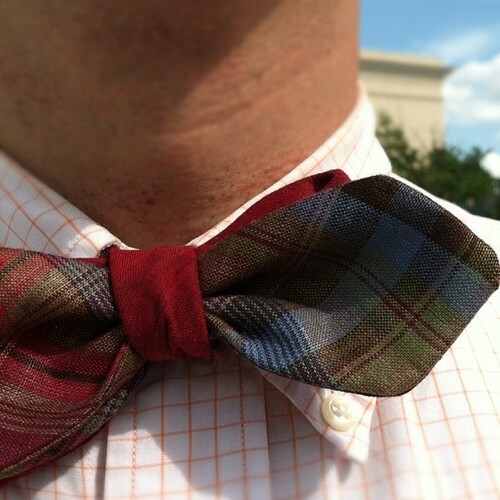 On side two, you can tone it down and Autumn it up with the subdued reds and hunter greens of a a classic plaid paired with a green chambray with yellow undertones. Twist and turn to create several other possible configurations. 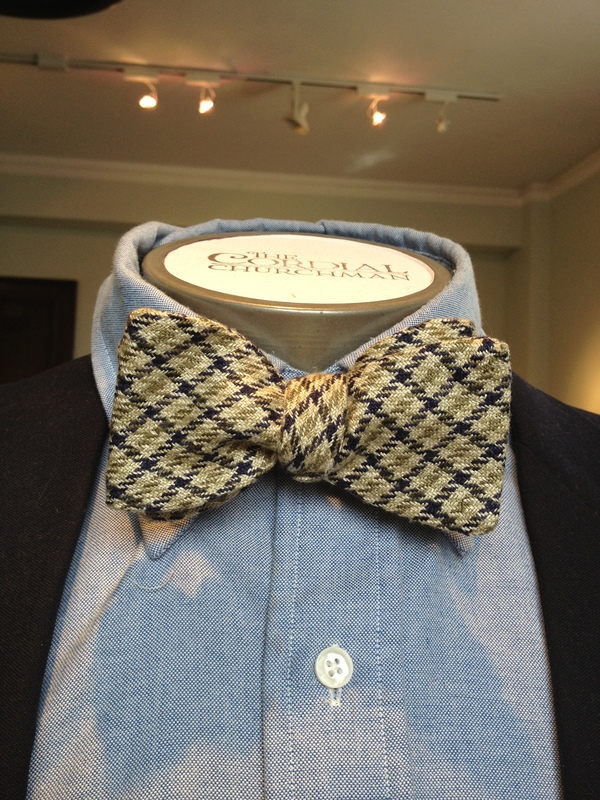 A remarkably versatile and personality-rich bow tie if there ever was one. Get it here. You may have noticed that I'm pretty obsessed with my Wolverine 1000 Mile boots. Pretty much wearing them every other day lately. Boy do I love these boots. Liberty of London fabric. It's a big deal. And you can't deny that it's beautiful. It's also luxurious and very much top shelf. This is your chance to grab it before it goes public. 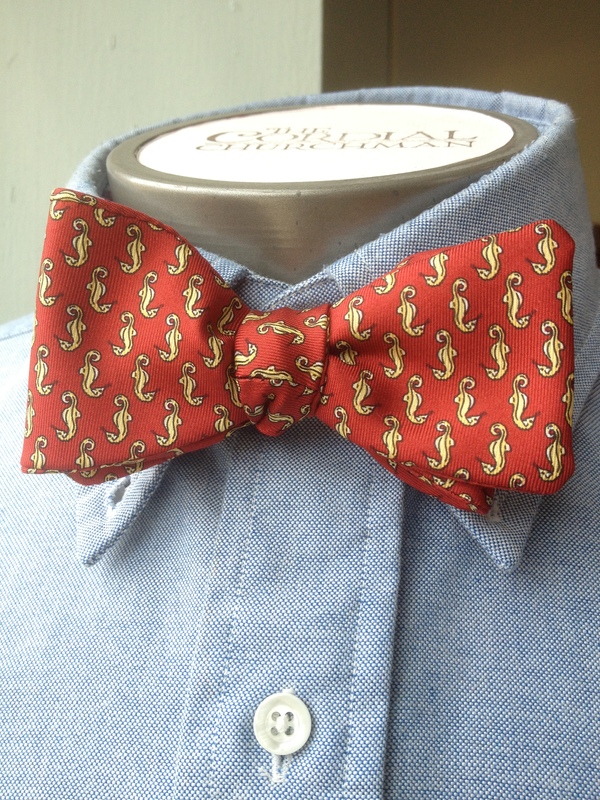 You won't find anything comparable for so low as we're offering it: $49. Plus, all the cash goes to Haiti. 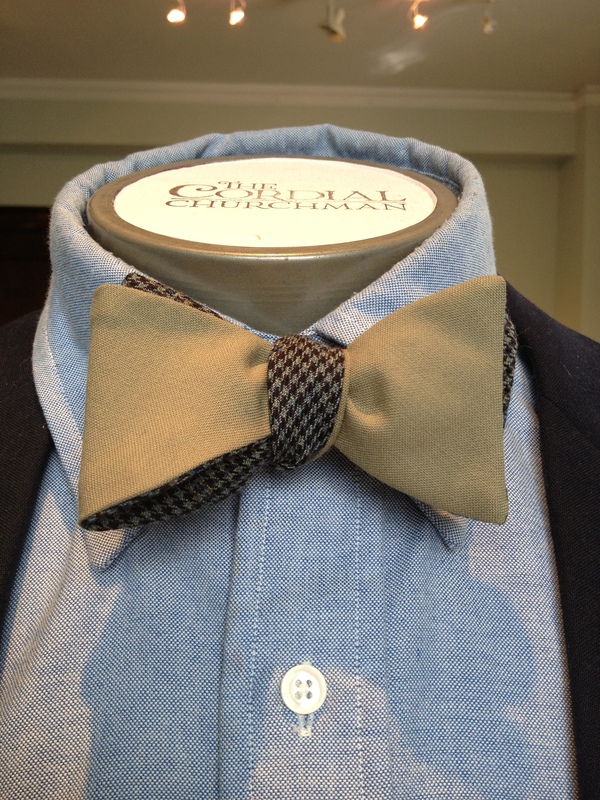 Speaking of luxurious bow ties, how about this throwback from The Cordial Churchman archives: The Johnny Cashmere. 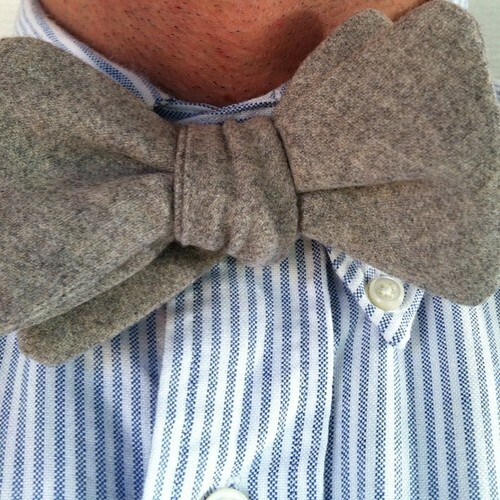 Simple gray with all the cashmere fluffy awesomeness you'd expect from that supreme fabric. 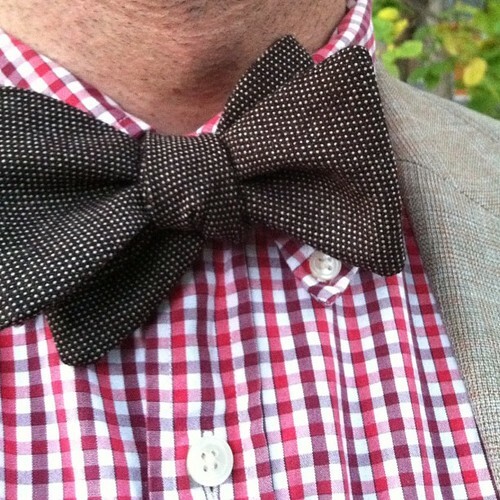 Classic Cut, and sure to be a classic of your Fall/Winter 2012 wardrobe----if you jump on it now. 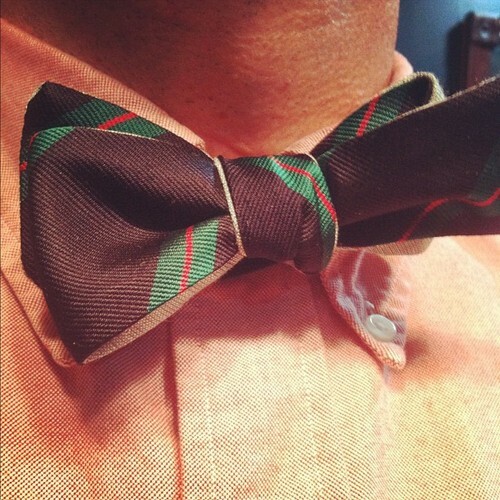 When I saw this in the studio, I couldn't wait for cooler weather to rock it. 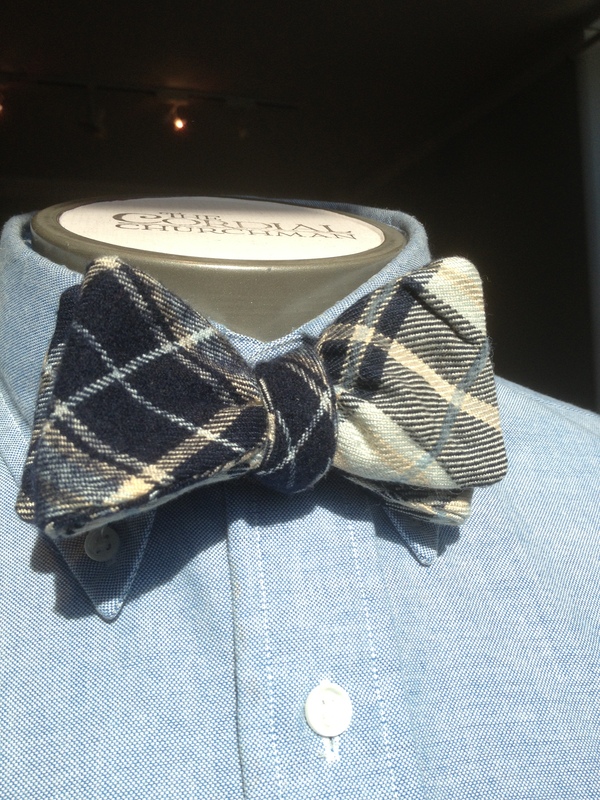 Thankfully we had one of the most pleasant pre-Autumn days yet, and the university stripe button down and Bill's Khakis fit the bill with this killing-me-softly bow tie. 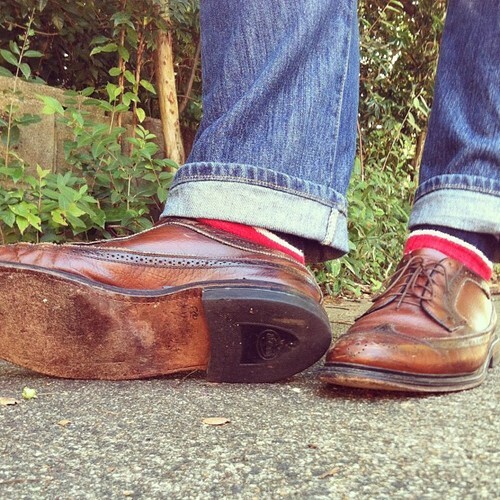 And---surprise, surprise!---I threw on the Wolverine 1000 Mile boots again. 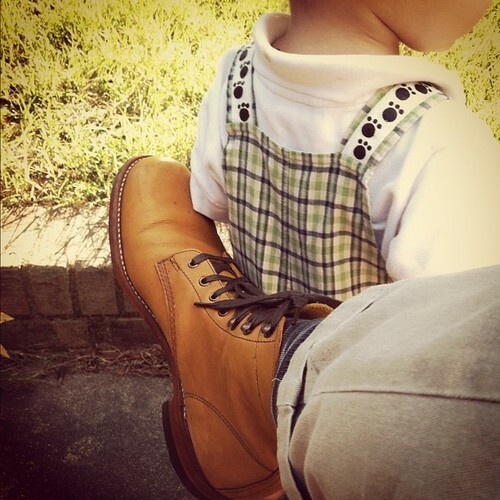 First, note the Wolverine 1000 Mile Boots. Okay. Good. 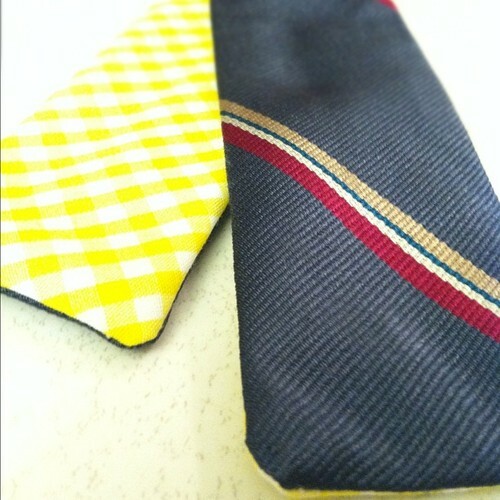 A striking reversible: vintage blue striped necktie silk on one side; yellow medium-scale gingham on the other. Cut in our very popular straight batwing shape, which yields a thinner bow and a fatter knot, and instantly increases your IQ by 15%. Run and grab it here. 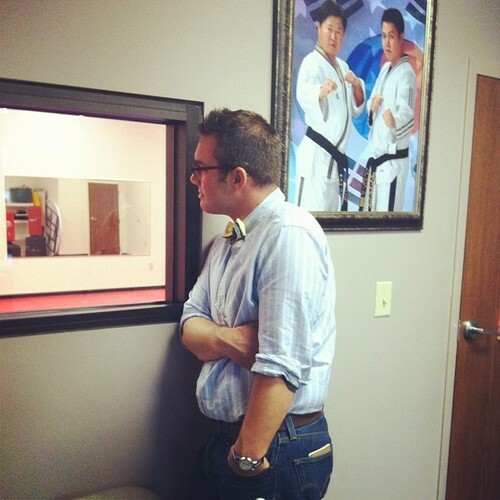 You'll never believe it, but I was the only one wearing a bow tie to watch their kids take a tae kwon do lesson. 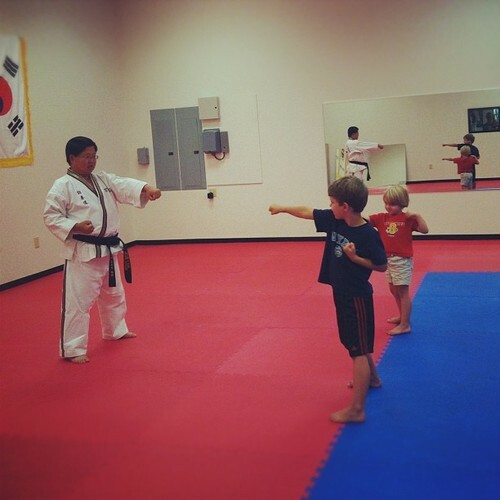 I think that Master Pak was pretty intimidated. Every now and then I go on these 3 or 4 day stints where the only thing I snack on is fruit and vegetables. 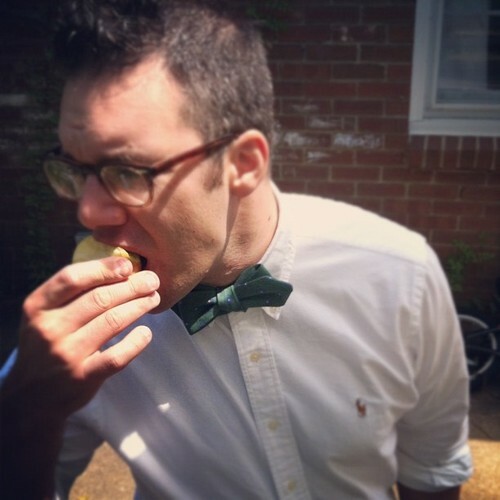 I get filled with self-righteousness and look down on people eating coffee cake and Doritos. But usually I'm the one eating the scones and chocolate-covered pomegranate bits. 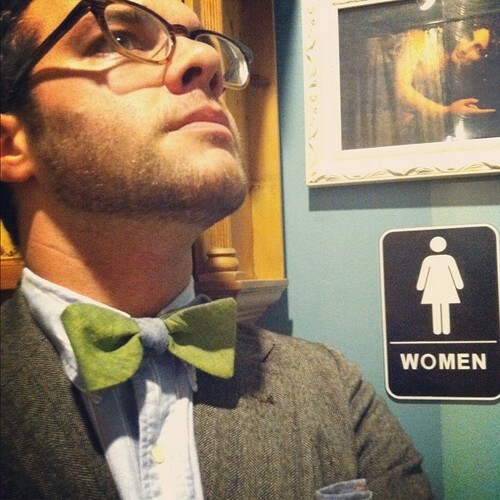 And the bow tie feels tight. And the collar feels tight. Etc. 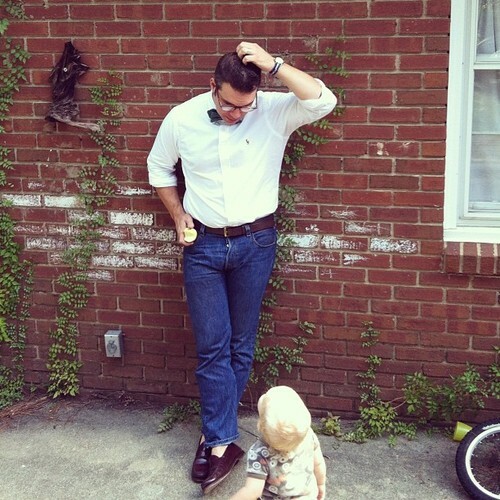 Caption: "Papa, is this one of your self-righteous, fruit-only days?" 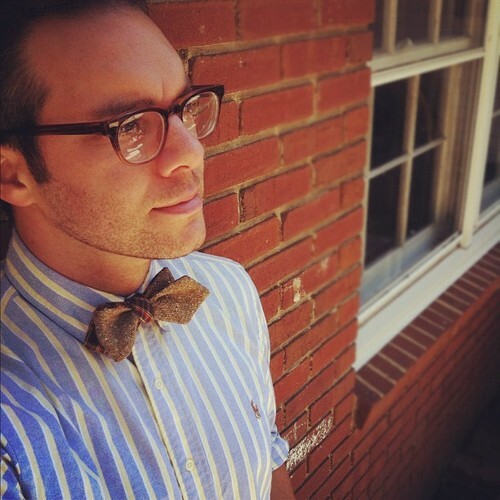 I really love this bow tie. Like, really love. Don't you? 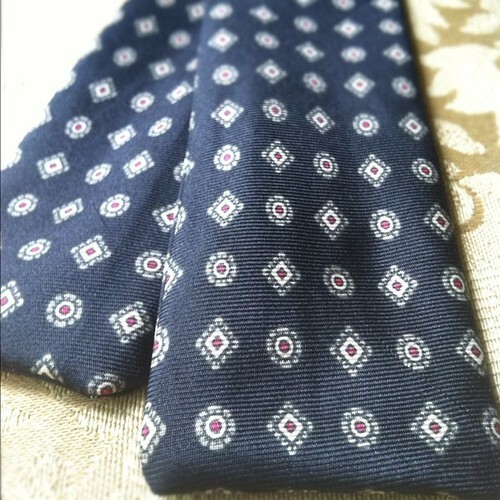 100% linen, from a vintage necktie. 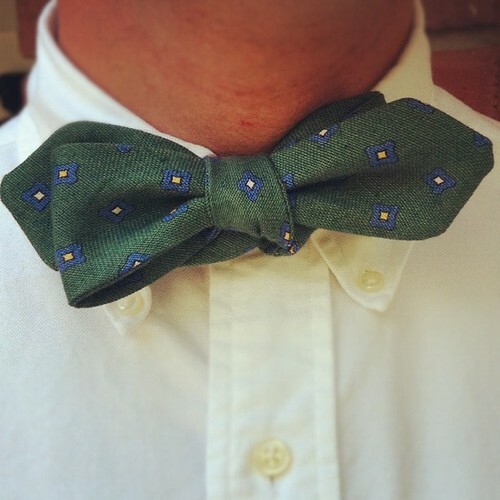 A handsome, bright-but-not-obnoxious green. 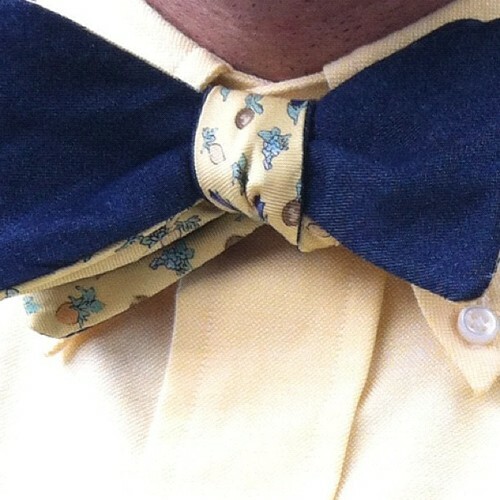 Yellow and blue foulard. Dang. Go and get it. 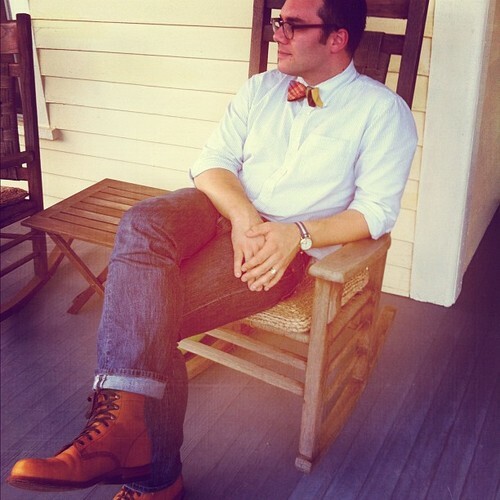 I'm delighted that Wolverine sent Ellie and me each a pair of their coveted 1000 Mile boots for our 366 Bow Ties for Haiti project. And I couldn't think of a better boot investment to make. Go get yourself a pair. 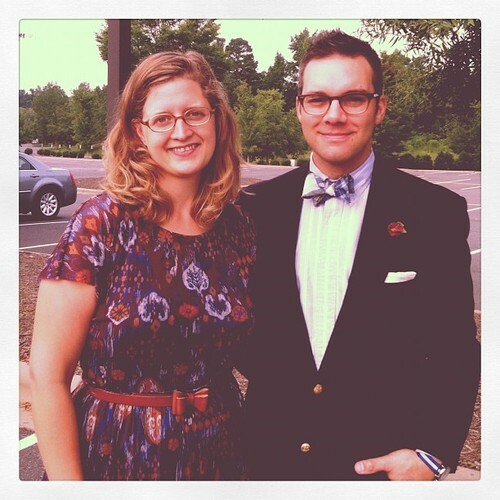 Me and my lady. She went away for a weekend. And I missed her sorely. She came home. And there was great rejoicing. 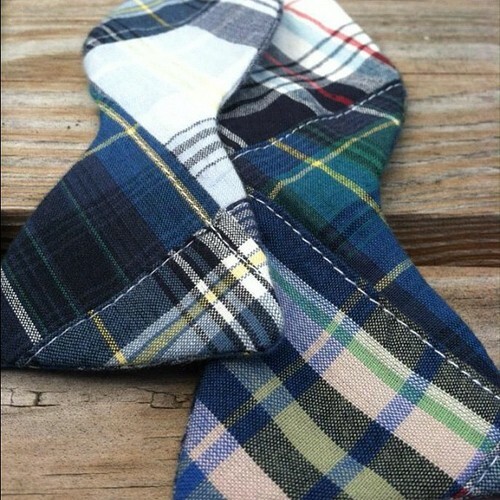 Run and grab this patch madras bow tie in classic cut. Can't go wrong. 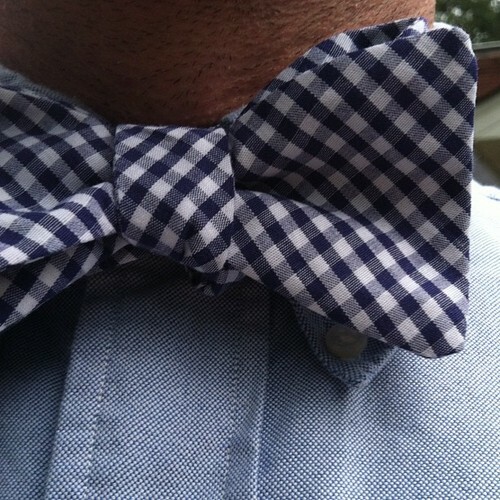 Simple blue gingham. Classic cut. 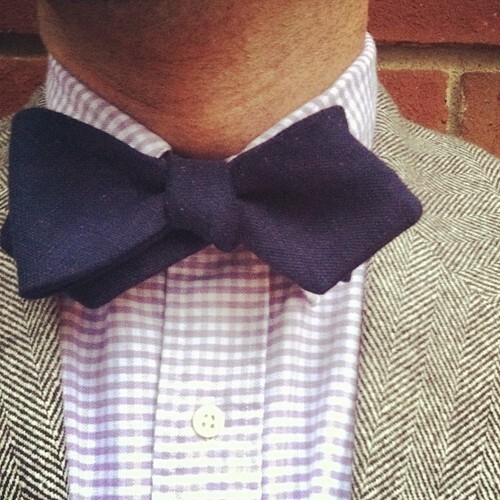 Classic style. Can't go wrong. Get it here. 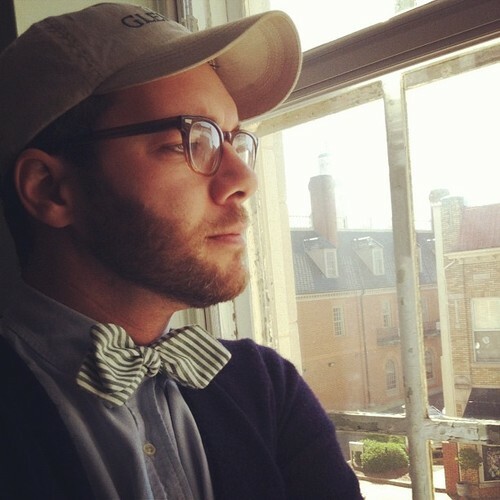 Taken in our home in Columbia, SC, while I was in a melancholy mood thinking about the fact that we were losing our bees tenant ever. And missing that lovely house. Looks like we may have gotten it rented, though. 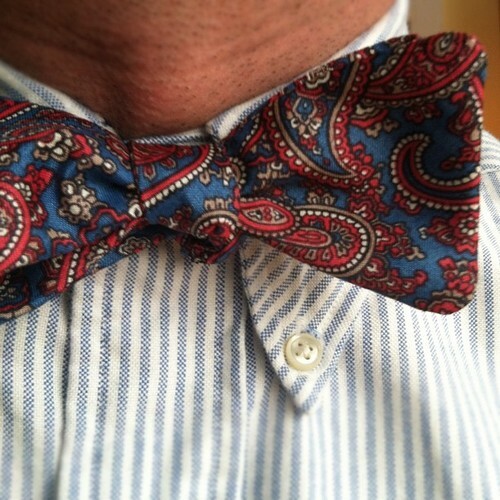 A beautiful silk paisley in narrow cut. Wow. 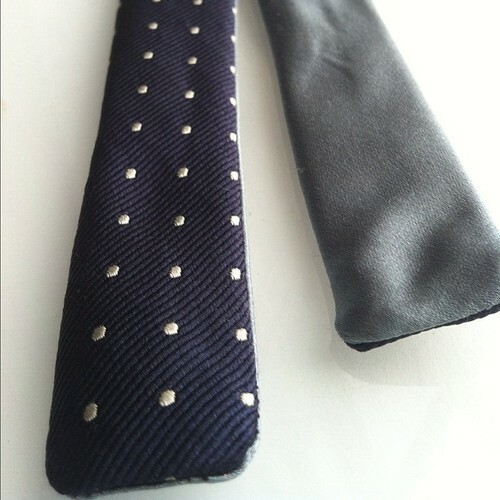 From a necktie. Only one available, ever. Get it. Ok, that's it for now. 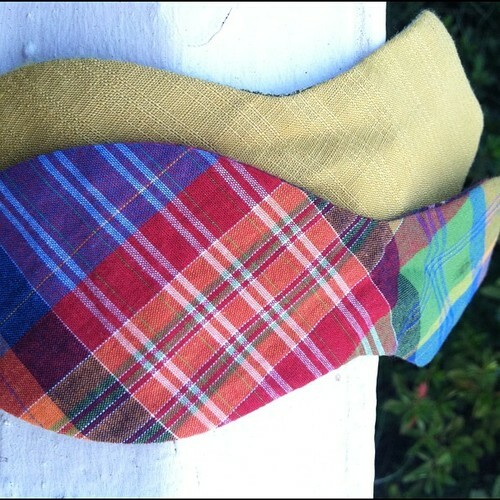 Don't forget that all of these bow ties go to help with a school in Haiti. Hopefully we'll get to visit that school before long.